What motivates this short note is the Colombo Telegraph report yesterday that Sirisena has activated “Plan B”. That is his meeting with Rajiva Senaratne and John Amatratunga proposing a UNP-SLFP (what about the SLPP?) so-called national government, excluding Ranil Wickremesinghe but including as many UNP traitors as Rajitha and John could drag in. Without Mahinda Rajapaksa where is the money going to come from to buy over a large number of parliamentarians? Who will come only for a cabinet job in the dying days of parliament and face ruthless public opprobrium? Big money has been paid to ALL who crossed-over early, don’t think Amunugama and Fowzie because they come from the monied class are above suspicion. The richer the greedier they say? What about Rajitha and John? Did they consult their party, go with a mandate to meet Sirisena and find out what the guttersnipe was up to, and come back and report to their party? In that case it’s a UNP information seeking tactical move. That’s ok. Or have they followed Sirisena’s example and sunk into the moral gutter typical of recent Sri Lankan politics? The bottom line is that it is imperative to impeach Sirisena. He seems to have undercut MR a second time, Ranil once, and the country all the time. No way MR can win confidence of Parliamanrt and people ..
Now; they have been named and shamed in an open air ..
No one will respect them now ..
Good thing for them is to leave it for democracy to take its natural course ..
RE: Has Sirisena’s Conspiracy Misfired? It fired all right, but it boomeranged and hit Sirisena and Mahinda, and woken up the sleeping giant, democracy and the peoples conscience. Amarasiri optimistically says ~ “…..and woken up the sleeping giant, democracy and the peoples conscience”. Before all see whether it is a conspiracy or not. Is listening to the people’s voice, conspiracy or @ least part of conspiracy? When a mandate has been given for gg for both president & PM, to go together, can’t PM’s detracting & attempting to overshadow the president be considered as violation of agreement (of going together) as expected by the people. And in such a development, doesn’t the mandate come to an end & shouldn’t they go for the country for fresh mandate instead of clinging in to power with silly excuses. It’s crystal clear that UNP govt. doesn’t have a mandate even with majority power in the house as they had received the mandate only to go together. The US, UK, UN please don’t involve incorrectly in our matters & press all the parties to support dissolving parliament & go for fresh mandate. RR. High time to get you upstairs examined by a psychologist without delay. No human being with sense will ever express such ideas unless he is a lunatic or a drug addict. Judging by the rate that MR is attending temples and churches, it does look that he’s so worried about this whole thing. This is the only chance for his prince to be ever able to rule this country; the point of no return for sanity. Silly-Sena is definitely feeling the heat, but is ignoring it as though he is on a high. Very soon he will realize his folly when MR will want to get even, for dumping him and standing up to challenge him at the 2015 elections. On the one hand, MS has proved time and time again he cannot be trusted. And so he has no genuine friends to speak or watch out for him. That said, MR is no pushover either. They hunt like a pack of hyenas, to serve their own self interests. High life, corruption and self aggrandizement at public expense, are hallmarks of his administration. They both don’t abode well for mother Lanka. If these issues are not sorted out soon, we may see the situation only get worse , which could give way to another strongman with foreign backing to break into the scene. This will cause such an upheaval of unparalleled and unimagined proportions. Sri Lanka’s 2500 year history has been spoofed with many such violent power grabs, and we can only hope and pray this situation and instability will not lead to that level of violence. Ooru-Sira with his gon look and gobba smile is the epitome of village idiot while Maru- Sira looks worried. May I ask edwin why ooru..? Yes you may, Vannihami, I am glad that at least one commentator is reading my comments. Ooru Warige – Sira (Sira the Pig). Some call him Balu Sira. But that would be an insult to dogs who are known for gratitude and defending the master. Hence the term Ooru – Sira, with all due apologies to Pigs, dead and live and those who have ended up in ham and bacon too. EDwin Rodrigo: you look like an Idiot. IS Kumar David asking your help at least until the electgions are over. Do you know god Natha. Look like? Wait till you see how I sound like. Natha? Natha? ….. you mean A. Natha? whose vehicle is a ජඩ බල්ලා? I don’t think my Guru needs my help but if he does I am ready. Oh really JD, are you an Expert on Idiots or and Idiot on Experts? You are right.Mahinda Rajapakse digged his own six foot ground believing Sirisena. It is the end of Populism that was generated during the February 10. This is always the fate of greedy creatures who are prepared to go to any low level in order to come power. They misunderstood the Sinhalese people as fools and they can tell aany lies anytime. Until now they said the North-East merger and devolution of power to North east can happen after murdering them. Now both Sirisena and Mahinda asking TNA to join them and we will everything. Sinhalese should understand how they making Sinhalese as fools playing game with the ordinary people. Enough is Enough. We should end the dirty politics and dirty politicians. Over 300,000 innocent Sinhala & Tamil lives were taken away by these life time murderers. Even though the impact is negligible by the writings of retired Marxists such as KD, the world be surely a better place to live when their pens too get retire! oh so Mahinda is your third choice? I agree with you wholeheartedly on your bottom line It’s time this uneducated, slimy President & all his kith & kin are sent home pronto. In fact, I would prefer if the whole lot, including his other opportunistic self serving mates who have already crossed over & others doing the the brokering are all investigated, at least by the Inland revenue for their ill gotten wealth. That would be a lesson for current & budding politicians that yobs cannot rule the country. We have to give tuition to the new USA Ambassador who met Speaker. The Vienna Convention on Diplomatic Relations (1961) Article 41 clearly states that diplomats cannot interfere into the internal affairs in the receiving country and such interference is construed as a violation of diplomatic protocol. Article 41 – 2. All official business with the receiving State entrusted to the mission by the sending State shall be conducted with or through the Ministry for Foreign Affairs of the receiving State or such other Ministry as may be agreed. These ‘Para Suddas’ are real hypocrites. They preach one thing and do something else like the mother crab walking sideways and asking the baby crabs to walk straight. Is there anyone capable of throwing Sirisena out of the door (kanen allala eliyata daanna)? The decision to oust Ranil Wickremesinghe is a textbook case of conspiracy. (1) Mahinda was appointed a Prime Minister when Sirisena knew well he has no majority. (2) The oath was administered under top secrecy when the need is for transparency and openness. (3) The story the RAW conspired to assassinate him. (5) The unethical and crude means to appoint Speaker Karusooriya and Sajith Premadasa. (6) After accusing Ranil as a corrupt politician embrace Mahinda Rajapaksa whom he accused as one who wanted to murder him and his family and dump them 6ft below the ground. President Sirisena now stands exposed as a third-grade politician unfit to govern the country. He has promised to resign his post within 24 hours if Wickremesinghe is re-elected Prime Minister which is now a foregone conclusion! 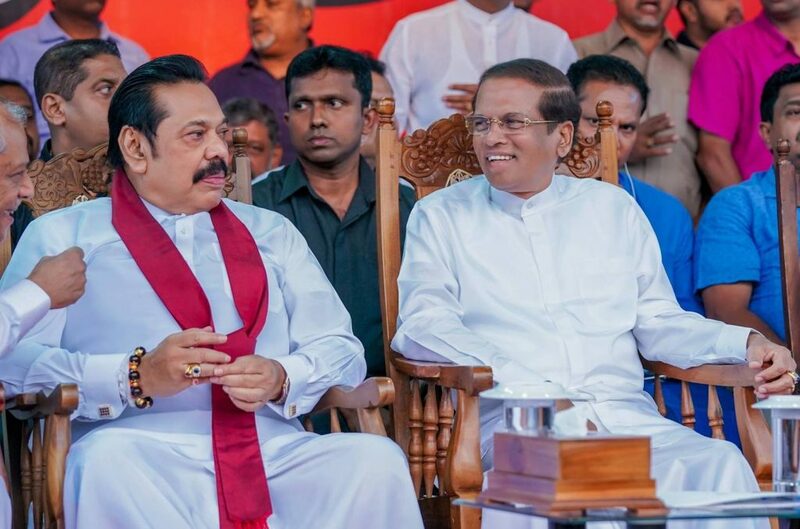 The entire Nation will support the President for the removal of Ranil Wickramasinghe but none other than crooks can endorse the selection of Mahinda Rajapakse as the replacement. The President made the biggest blunder in his political career. Sirisena’s main aim is to be two time President of Sri Lanka. By making M.R. as PM now, he is making sure of being the next President of SL. I do hope that his plan will bite the dust[fail]. SL now needs a new President and PM whose image is not a tarnished one. No Ranil/MR/Sirisena. Let the new contestants put forward their PLANS on how to get our country become a peaceful and prosperous one. No more HATRED towards the minorities-religious or racial. The Old Idiot has appointed Rambukwella as Media person again. During his time in the last regime, Lankawe was 174 out of 179 countries evaluated for Media safety. He probably thinks that Rambo will do his job again. The mistake is none of them understand where there position now is compared to 2013, 2014. If Rambo allow one journalist is touched, his all kind of visas will go and on his next fight, he will be stopped and sued under universal jurisdiction. He is going to stay at home even if he falls down from a hotel balcony with full dope. Old Idiot got into a problem that is going to as dangerous as winning and losing, both. Now the Conspirator 4th begged the foreign embassies not to take any action and have saved them. But this will not be forever. If the Old Idiot loses, that is end of his and New King’s political life. Now UNP heads are struggling to save them from any criminal charges by peacefully negotiating with them a deal, though not guaranteed to work outside. The idiots showed their mental capacity by falsely evaluating their ability. In 2005 he lost the election to Ranil but became as EP by Tamils. In 2010 he took the 32 nation’s help and conducted a criminal war and won the election using his criminal conduct. In 2015, the idiot listened to astrologist and lost the election, two years earlier. Now, the 4th time he shown his brain capacity by being caught in a situation like this. They have not given penny to anybody crossing but promising 500 million. TNA candidate who crossed is now crying he didn’t a penny! Once this message passes, many who crossed may return back. Old Royals probably going to hold the money close the chest and back off from this game. That is what Ranil and Karu consulting, it seems, though many UNP and SLFP stalwarts coming and going to meet the leaders. Have there been instances in History both Medieval and Modern where a draggle-tailed guttersnipe betrayed so many people in one go? Judging by the February 19th results the majority must have voted for him with hate and contempt! No that is not the case. Yes it is a huge gamble, and these are brave men, (not foolish) men for taking the risk. Remember that this could have been done in August 2015 with anyone but MR as Prime Minister. Yes spectacularly and let me give you the reasons. The explanation given by MS for sacking RW baffles me and 72 hours on after the speech I am still trying to unravell. Except for Mahintha loving Sinkalams we all know the answer. In his speech he said the following. He was referring to Wickremesinghe’s free-market economic policies and public-private partnerships with companies from China and India to operate strategic centers such as ports and airports. ***Talks between Sri Lanka and India over the latter seeking control of the Colombo harbour East Container Terminal (ECT) in terms of an MoU signed in April 2017 has been delayed due to the sacking of the UNP-led government. The resaon why RW was sacked was because RW under pressure from INDIA was sidelining ” Cheenavedi” and handing over SOVEREINGTY to INDIA. It was too much for MS & MR as they were bedfellows when they handed over everything to Cheenavedi.. Why didnt MS ask MR who handed over Ports and Airlorts to Cheenavedi. It hasnt really misfired instead it CRASH landed. Whether we like it or not if Sinhala Lanka under MS & MR try to bring Cheenavedi in Sinhala Lanka will be turned into rubble. That is for real. As you all notice Dayan the Pankawalla has these days reduced himself to commenting rather than singing “Mahintharam “. I would like him to alert the Nation regarding the extent of the danger facing the Country. For Sinhala Lanka the chioce is ” Damned if you DO damned if you DONT. It cant be any STARKER. People of Sri Lanka are fooled by ruthless, corrupt, uncivilized and inhuman politicians for long and it exposes illiteracy of majority people and nothing else. Sinhala leaders and Buddhist Monks are ruining Sri Lanka prosperity and the masses are real fools as country is pawned to China, India and others. Countries that have fair policies prospered economically well that led to huge development in many areas including prosperity and high standard of living for it’s people. Former Malaysian Corrupt PM was brought down from power and charged and this is a classic example for leaders in Sri Lanka. Tamils and Sinhalese who left Sri Lanka are doing very well in many ways while Sri Lanka continues to rely on foreign Aid. As local politicians unable to be fair, democratic and apply rule of law equally, Sri Lanka must be ruled by country that applies strict rule of law, Law Enforcement and Justice system to end corrupt and criminal politicians, people’s struggle, sufferings and bloodshed! Sirisena is desperate. It is hard to guess what his next move will be, as it seems to be out of his control. It is anybody’s guess who is pulling the strings on him. It could be slightly harder than mice belling the cat. Kumar David: You are gay-abandonly using words like gutter-snipes, predators, bribe-takers, etc. etc. Why the hell do you keep our state of ‘The Lankan October Happening’ as a conspiracy? 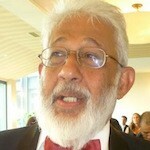 Lay-Lankans used plain commonsense and identified it as a ‘coup’. Yesterday CT gave it the full name ‘coup d’etat’. Speaker Karu J finally said it is a ‘bloodless coup’. 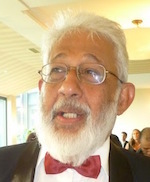 Wakey wakey wakey……….Wake up Prof Kumar David. Your statement ~ “The filthiest gutter cases like TNA cross-overs will be lynched when the full swell of public anger explodes”. Your prediction will be proved right because the TNA electorates are discerning. Perhaps the word ‘filthiest’ may be dropped here and used exclusively to describe ALL who crossed-over early for money, the ilk of SB Dissanayake, Vasu, Fawzi, Batheudeen. ‘still-thinking’ Hameed, Rajiva Senaratne and John Amatratunga. These worms will crawl again. Clearly you are riled by the turn of events not necessarily you are a patriot but because you just cant stand MR (or potentially sinhalease). You are of course entitled to your opinion and other fancies. However, if you want to express your views try and make it little decent. Guttersnipes, bandits etc may be amongst your family members but we are here to read opinions scribed by decent folks not by fraustrated senile old fools. There is a time to hang the coat, close the pen and forget the ability to make any contribution (positive or negative) to the society. You are now at that stage. I know you want to thank me for reminding you that, and you are very welcome.